On Saturday April 9, Indigenous artists from across Western Australia will meet in Fremantle to highlight the diversity of Aboriginal art. Revealed: WA Aboriginal Art Market is a special event hosted by the Fremantle Arts Centre, and will have textiles, ceramics, jewellery and more on display from Kimberley, Pilbara, Mid-West, Goldfields, Western Desert and Great Southern art centres. The free event takes place between 10am and 4pm in the Centre’s Front Garden, and will feature carving demonstrations and weaving workshops. The market is part of the WA State Government’s annual effort to showcase WA’s regional artistic communities. writingWA has introduced the Hachette Mentoring Program for Regional WA Writers. The program is open to any resident of Western Australia’s nine regions (Gascoyne, Goldfields-Esperance, Great Southern, Kimberley, Mid-West, Peel, Pilbara, South West and Wheatbelt), and participants are asked to submit a manuscript for the chance to win a mentorship with Hachette publisher Sophie Hamley. Entries may be fiction, non-fiction or young adult fiction. One manuscript will be selected every year, and the closing date for this year’s selection is 23 March 2016. You can find more information and the application form here. Also, applications for the first round of the 2016 Country Arts WA Regional Arts Project Fund close on Friday 11 March. Amounts of up to $20,000 are available for community groups and a total of $15,000 is being made available for applications from individuals. Do you know someone who deserves a NAIDOC award? Time to get those submissions in, as nominations for the 2013 Mid West NAIDOC Awards close 5pm tomorrow, Friday 21 June. The annual awards recognise outstanding achievements made by Indigenous Australians to improve the lives of Indigenous people, or promote Indigenous issues in the wider community. For more information about NAIDOC Week 2013, visit the NAIDOC website. 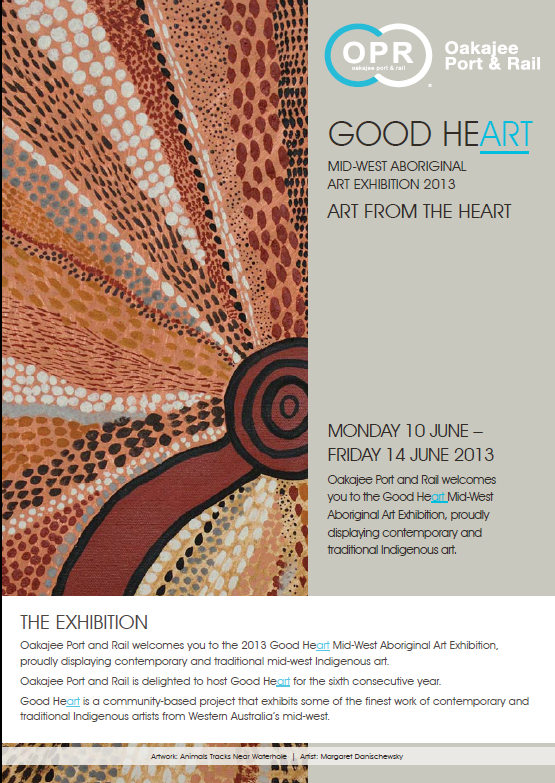 YMAC would like to congratulate one of our Community Liaison Officers, Les Hill, for being chosen to exhibit his artwork in the 2013 Good Heart Mid-West Art Exhibition, which finishes up in Perth this evening. His collection of pieces reflects the everlasting wildflowers unique to his home town of Mullewa and the Murchison River. 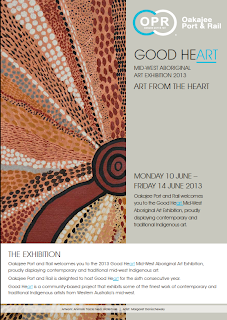 This has been Good Heart Art’s sixth exhibition sponsored by Oakajee Port and Rail, and almost 200 pieces from over 50 new and established mid-west artists were showcased. For more information on this year’s event, visit the Good Heart website. If you would like to know more about Les and other YMAC Community Liaison Officers, read our blog post from March this year.